Within an International Week Of Solidarity for the illegally arrested 5 patriots, who have been in jail for 9 years now, a manifestation took place in Austria on September 12th. The ÖKG (Austrian Cuban Society) and the Austrian committee “Free the Five” organised a solidarity manifestation, claiming the 5 to be released. 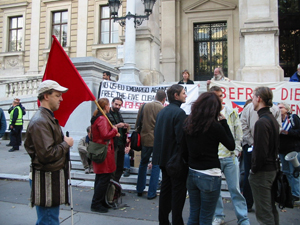 The manifestation was supported by several anti-imperialist and progressive organisations and took place in front of the University of Vienna. Banners were rolled out, claiming freedom for the Five. The International Platform against Isolation, additionally demanded on its banner, that the US and EU embargos against Cuba have to be stopped immediately. Among the the participating organisations were CDR Austria “Antonio Maceo”, Ché (cultural association), Bolivianischer Zirkel, DVL umbrella association “Gemeinsam für Lateinamerika” (Enlazando Alternativas), SJÖ, FUNKE, KJÖ, KSV, Chilean Socialist Party Austria, Herman Dworczak (SOAL member), AIK, ASt, Revolution, International Platform against Isolation and Front for Rights and Freedoms. After some short speeches by ÖKG and ASF co-founder Leo Gabriel, in front of the mainbuliding of the Universtity of Vienna, the 50 protesters headed to the US- embassy to speak out their demand to free the five Cuban patriots and to uncover the terror of the US- government. Loud slogans ciritcised Bush’s war policy. The protest finished at 18.30 in front of the US-Embassy. The ÖKG plans, together with the Chilean Socialist Party, a discussion on “USA and Terroism - political manipulation” for September 21st at the Centro Once, Scheidergasse 15a, 1160 Wien.